Earn 123 points upon purchasing this product. Lemon Balm is calming, it relieves stress and occasional anxiety. It also supports restful sleep & promotes a calm mind and mental well-being. For over 2,000 years, lemon balm has been used to calm the mind and take the edge off daily stress. Our alcohol-free Lemon Balm contains the full range of compounds that occur in the plant naturally. Lemon Balm is ideal for the temporary relief of normal everyday stress, occasional anxiety, and for promoting a calm, positive mood. Use 1234 points to purchase this product! Lemon Balm is calming, it relieves stress and occasional anxiety. It also supports restful sleep & promotes a calm mind and mental well-being. For over 2,000 years, lemon balm has been used to calm the mind and take the edge off daily stress. 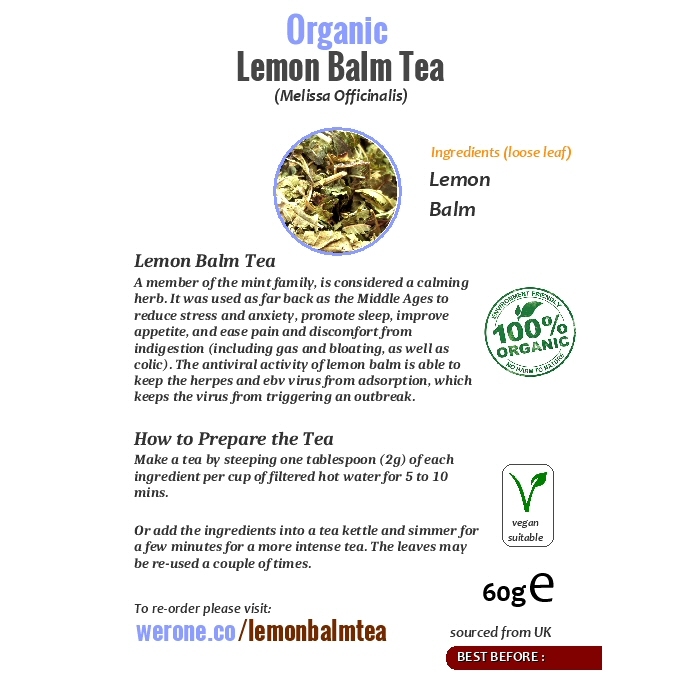 Our alcohol-free Lemon Balm tea contains the full range of compounds that occur in the plant naturally. A member of the mint family, is considered a calming herb. It was used as far back as the Middle Ages to reduce stress and anxiety, promote sleep, improve appetite, and ease pain and discomfort from indigestion (including gas and bloating, as well as colic). The antiviral activity of lemon balm is able to keep the herpes and ebv virus from adsorption, which keeps the virus from triggering an outbreak. Lemon balm has been used for centuries to care for wounds and quell sleeplessness. Some attest that the pure, sweet aroma of the oil promotes a feeling of relaxation. Most sweet oils are said to provide the same benefit. Lemon balm encourages restful sleep, especially for those who have trouble falling asleep. In one study, parents reported their children slept more peacefully throughout the night with lemon balm supplementation. It doesn’t only benefit restless children and their sleep-deprived parents. A placebo-controlled trial found that menopausal women suffering from interrupted sleep reported much better rest after taking a lemon balm and valerian extract. The first cosmetic use of lemon balm goes back to the 14th century when the Queen of Hungary reportedly used it to erase years from her face by softening wrinkles. Today, it’s still recommended for boosting the appearance of skin and reducing the appearance of fine lines. Lemon balm also contains volatile components, such as caffeic acid, p-coumaric acid, and rosmarinic acid, that work together to support the body’s natural response to the harmful organisms that cause lip blemishes. Although lemon balm calms the mind, it certainly doesn’t dull the mind. In the right serving, it does the exact opposite. An Australian study reported improved alertness in participants who took the herb. The reported side effects, if you can call them that, included calm feelings and a positive mood. Studies like the one above observed improved memory and problem-solving in test subjects, regardless of age, after taking lemon balm. Young or old, those taking lemon balm supplements displayed improvement in problem-solving skills and recall. Though preliminary, some studies have examined lemon balm and its relation to brain health. When combined with acupuncture, eugenol, a powerful antioxidant in lemon balm, helped test subjects recover memory-related functions. Another study showed participants had significant improvements in brain function after 16 weeks of administration of a lemon balm extract containing 500 mcg of citral—a component of lemon balm oil. Another study reported that lemon balm helps stimulate memory and enhance mood. A phytochemical found in lemon balm suppresses the enzymes that break down the neurotransmitter responsible for memory and thought. 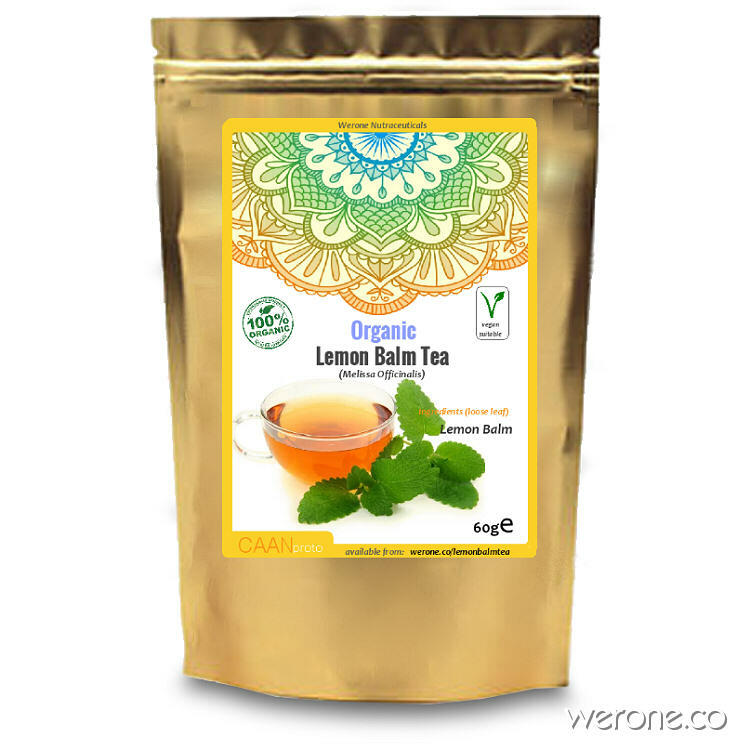 Lemon balm is loaded with antioxidants that protect cells from free radicals. Studies on eugenol and rosmarinic acid show they support healthy brain aging. The list of powerful antioxidants includes ferulic acid, caffeic acid, and quercetin. The liver detoxifies dangerous compounds from the body and, over time, can become tired and sluggish, especially if you follow an unhealthy diet. Animal studies have found that lemon balm is effective at protecting the liver from some of the negative effects of an unhealthy diet. Lemon balm also supports the liver’s production of two important antioxidants—glutathione and superoxide dismutase. Many herbs that provide antioxidants also promote balanced blood sugar. Although preliminary, research suggests that lemon balm may encourage normal blood sugar levels. Beyond the positive effects on memory, thinking, and mood, research suggests lemon balm supports brain health. Antioxidants like eugenol detain free radicals before they can attack brain cells. Rosmarinic acid, a key compound in lemon balm, is beneficial in this regard. If the brain doesn’t get enough blood, it can quickly become an emergency that affects brain function. Animal models show that, when provided shortly after such an episode, lemon balm appears to protect the brain. Made with organic lemon balm (melissa officinalis) 1:1 strength with high quality vegetable food-grade glycerine, non-GMO. Make a tea by steeping one tablespoon (2g) of each ingredient per cup of filtered hot water for 5 to 10 mins. Or add the ingredients into a tea kettle and simmer for a few minutes for a more intense tea. The leaves may be re-used a couple of times. 1. Taavoni, S., Nazem, Ekbatani N., Haghani, H. “Valerian/lemon balm use for sleep disorders during menopause.” Complement Ther Clin Pract. 2013 Nov;19(4):193-6. doi: 10.1016/j.ctcp.2013.07.002. 2. “Herbs and Natural Supplements, volume 1, 4th edition: Braun & Cohen.” 2014. Print. 12 Jan. 2017. 3. Scholey, A., Gibbs, A., Neale, C., Perry, N., Ossoukhova, A., Bilog, V., Kras, M., Scholz, C., Sass, M., Buchwald-Werner, S. “Anti-stress effects of M. Officinalis-containing foods.” Nutrients. 2014 Oct 30;6(11):4805-21. doi: 10.3390/nu6114805. 4. Liu, Z., Niu, W., Yang, X., Wang, Y. “Effects of combined acupuncture and eugenol on learning-memory ability and antioxidation system of hippocampus in Alzheimer disease rats via olfactory system stimulation.” J Tradit Chin Med. 2013 Jun;33(3):399-402. 5. Obulesu, M., Rao, D.M. “Effect of plant extracts on Alzheimer’s disease: An insight into therapeutic avenues.” J Neurosci Rural Pract. 2011 Jan;2(1):56-61. doi: 10.4103/0976-3147.80102. 6. Spiridon, I., Colceru, S., Anghel, N., Teaca, C.A., Bodirlau, R., Armatu, A. “Antioxidant capacity and total phenolic contents of oregano (Origanum vulgare), lavender (Lavandula angustifolia) and lemon balm (Melissa officinalis) from Romania.” Nat Prod Res. 2011 Oct;25(17):1657-61. doi: 10.1080/14786419.2010.521502. 7. Ali, Zarei, Saeed, Changizi Ashtiyani, Soheila, Taheri, and Fateme Rasekh. “Comparison between effects of different doses of Melissa officinalis and atorvastatin on the activity of liver enzymes in hypercholesterolemia rats.” Avicenna J Phytomed. 2014 Jan-Feb; 4(1): 15?23. 8. Zeraatpishe, A., Oryan, S., Bagheri, M.H., Pilevarian, A.A., Malekirad, A.A., Baeeri, M., Abdollahi, M. “Effects of Melissa officinalis L. on oxidative status and DNA damage in subjects exposed to long-term low-dose ionizing radiation.” Toxicol Ind Health. 2011 Apr;27(3):205-12. doi: 10.1177/0748233710383889. 9. Weidner, C., Wowro, S.J., Freiwald, A., Kodelja, V., Abdel-Aziz, H., Kelber, O., Sauer, S. “Lemon balm extract causes potent antihyperglycemic and antihyperlipidemic effects in insulin-resistant obese mice.” Mol Nutr Food Res. 2014 Apr;58(4):903-7. doi: 10.1002/mnfr.201300477. 10. Nagababu, E., Rifkind, J.M., Boindala, S., Nakka, L. “Assessment of antioxidant activity of eugenol in vitro and in vivo.” Methods Mol Biol. 2010;610:165-80. doi: 10.1007/978-1-60327-029-8_10. 11. Luan, H., Kan, Z., Xu, Y., Lv, C., Jiang, W. “Rosmarinic acid protects against experimental diabetes with cerebral ischemia: relation to inflammation response.” J Neuroinflammation. 2013 Feb 17;10:28. doi: 10.1186/1742-2094-10-28. You can return unwanted items by post within 7 working days of receipt of your goods. Please ensure that the item you are returning is unopened and in re-saleable condition. Email us for a return address and procedure. 2 to 3 Day - Monday to Friday, 'may' deliver to residential addresses on a Saturday. Next Day - Monday to Friday, 'may' deliver to residential addresses on a Saturday. Takes from 5 to 10 Days - Monday to Friday, 'may' deliver to residential addresses on a Saturday. 5 to 7 days - Monday to Friday, 'may' deliver to residential addresses on a Saturday. 1 to 2 days - Monday to Friday, Only available to: Belgium, France, Germany, Greece, Ireland, Italy, Netherlands, Portugal, Spain, Sweden. from £9.00 or 3 day courier service from £21. USA shipments will only be sent by post due to customs issues with courier services. * Please ensure that someone is available to sign for the parcel at the delivery address. You may provide a work address if you wish during the checkout process. In UK Royal Mail will only make ONE delivery attempt, if nobody is available at the address, they will leave a card and expect you to contact them, they cannot leave with a neighbour unless you pre-arrange this with us. A re-delivery will cost £3.00 and a change of address will be £6.50, you may also collect from their collection office. If the shipment is not collected after 4 days they will return it back to us, re-deliveries will be chargeable. Note, if you choose the wrong delivery zone, we will re-calculate the delivery charge and advise you by email if there is any donation shortfall to ask you to pay the balance on paypal..
Africa , Albania, Algeria, Australia, Botswana, Bahamas, Canada, Canary Islands, Croatia, Egypt, Jamaica, Jordan, Kenya, Malaysia, Mauritius, Monaco, Moldova, Morocco, Norway, South Africa, Sudan, Switzerland, Syria, Turkey, Ukraine, Zambia, Argentina, Barbados, Brazil, Chile, Colombia, Costa Rica, Equador, Israel, Jamaica, Kuwait, Libya, Lebanon, Mexico, Oman, Peru, Puerta Rica, Saudi Arabia, Singapore, Taiwan, Thailand, UAE, USA(surface post only) Uraguay, Yemen, Australia, Bali, China, Hong Kong, Indonesia, Japan, South Korea, Malaysia, New Zealand. (5 to 7 days) >5kg FREE but Not Insured! We can provide a refund if you are unhappy with your gift but you will need to pay the return costs and the individual items must not have been opened and must be returned in original condition and with all packaging intact. Any refunds which are authorised should be returned to the address on the paperwork with a copy of it along with your reason for return. Items MUST be returned UNOPENED and in the condition they were sold in. Special Delivery are a fast and reliable service. The delivery to the British Isles is a 1-2 day service (subject to stock) when choosing these methods. We cannot 'guarantee' a nextday delivery, though often it will arrive nextday (except during Holiday Periods). Please make your choice on the checkout page of our gifting cart. Parcels weighing over 1kg in weight will automatically be sent using Courier nextday from day of despatch unless otherwise specified. Most orders placed before 12 Noon are usually be despatched sameday but we cannot guarantee this, [email us] to find out what stage of your gift is at. Donation/Gifts placed late Friday afternoon or on a weekend, will not be sent until the following Monday or Tuesday. Should you wish to have a Saturday Delivery, there is an additional cost of £18. COL Magic™ - COLLAGEN Formula For Skin, Hair, Nails & Joints. The combination of Curcumin and Boswellia forms one of the most sophisticated natural anti inflammatory formulas available. The power behind this combination is two-fold: Curcumin suppresses the root causes of inflammation, while Boswellia acts on existing inflammation in our bodies. Inflammation drives Cancer by stimulating a rise in levels of a molecule called microRNA-155. Taken together, Curcumin and Boswellia are much more than just a band aid to temporarily relieve pain. The combination of these complimentary anti inflammatory agents allows us to both prevent future inflammation and experience relief from current inflammation. Reducing current inflammation results in pain relief. VBLOCK™ is a broad-based organic nutraceutical formula containing herbal extracts and other nutrients which have been shown in previous studies to provide antiviral support and may reduce inflammation. VBLOCK™ attempts to block the pathways which are used for replication and infection of immune system B cells. VBLOCK™ has not been proven in this respect though it’s individual ingredients have been shown to provide antiviral efficacy. Antifibrotic and mass reducing herbs such as in AdhesioNIL™ are used to treat abdominal disorders such as uterine fibroids and liver fibrosis, and are also used to treat skin masses in scleroderma; it is possible that they function by increasing the degradation of fibrous tissue via hyaluronidase. is based on elements from herbal formulas in traditional Chinese medicine for nourishing the blood and replenishing Qi due to weak Heart and Spleen functions. Such herbal remedys are commonly used by Chinese doctors for insomnia, forgetfulness, palpitation, tiredness, coldness, fluid retention, poor appetite experienced by the overworked and stressed. Beta 1, 3-D Glucan is an intensely purified, biologically active complex of beta glucans. Beta 1, 3-D Glucan is readily taken up and converted in the body into a form which is specific to a site on all immune cells that have a CR3 receptor, e.g. macrophages, neutrophils, eosinophils, monocytes, and NK cells. These immune cells make up a large part of the immune system’s main defense mechanism. Bovine colostrum’s immune factors from immunoglobulins, are known to be effective against pathogenic organisms in the intestinal tract. It is known to contain substances that protect from infection and disease, stimulate growth, and contribute to numerous other health factors. Our bovine colostrum has one of the highest Immunoglobulin G contents 35% of any dietary colostrum sources rich in lactoferrin – IgA, IgD, IgE, IgG, and IgM. Diatomaceous earth is a fine tasteless powder is made up of the fossilized microscopic skeletal remains of hard shelled plant like algae called diatoms. When these millions of microscopic particles move through the stomach and digestive system they absorb and attract bacteria, heavy metals, pesticides and other pathogens. Also during this process larger parasites are cut or scratched by the hard and sharp DE, which dehydrates and kills them. Parasites are not just a problem for third-world countries; studies have shown they are also a major problem in the developed world too. One study found that 32 percent of people tested positive for parasites. Though parasites are unknown to their hosts, they can lead to a multitude of health problems because they emit toxins that can overwork vital organs such as the kidneys and liver. This can lead to fatigue, weight gain, irritability, and more. This blend is one of the most powerful available: Indications: Roundworm, threadworm, tapeworm, pinworm, hookworm, ringworm, amoebae, microscopic parasites and parasitic larvae, eggs, Shigella, Staphylococcus and Streptococcus. The herbal supplement, Amrit Kalash, was developed thousands of years ago by the great Ayurvedic sages as the one formula for total health. Instead of treating symptoms of disease, Ayurvedic wisdom offered Amrit Kalash as a natural, holistic approach to help root out the underlying cause of disease. Amrit boosts mental potential and your overall healthand has been proven in studies to reduce the damage caused by cancer treatments by protecting the healthy cells of the body. Our Lugol's formula is the one recommended by Dr. Hulda Clark. According to Wikipedia a "5% solution consists of 5% (wt/v) iodine (I2) and 10% (wt/v) potassium iodide (KI) mixed in distilled water." However, the convention for naming Lugols Solution this way is misleading. The Potassium Iodide also contains iodine. In fact, 76% of the weight of each KI molecule is the iodine atom. Therefore, in order to understand the full amount of iodine in a solution add: the amount of pure iodine (I2) PLUS (.76 x potassium iodide). DAO is the only dietary foodstuff in the world for dietary treatment of intolerances to foodstuffs as a result of histamine intolerance (which may be caused by leaky gut).